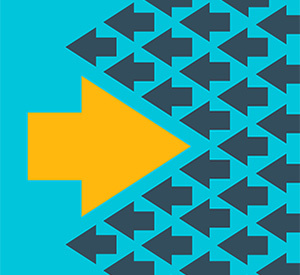 Most contact centers in the financial industry don’t realize their full potential. Here’s how banking providers can put their contact center in the top 5% and generate maximum ROI. In Cornerstone Advisors’ What’s Going On in Banking study, senior executives at financial institutions were asked how “future-ready” business functions within their institutions are. Just 26% of execs said the contact centers in their organizations were somewhat or very future-ready — down from 31% who rated that function future-ready last year. 1. Innovating. 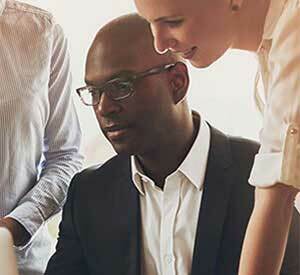 With the basics of contact center management mastered, Innovating contact centers — accounting for 5% of financial institutions — are in position to meet changing customer demands by utilizing tools ranging from chatbots and virtual agents to enterprise-wide CRM and advanced fraud detection. 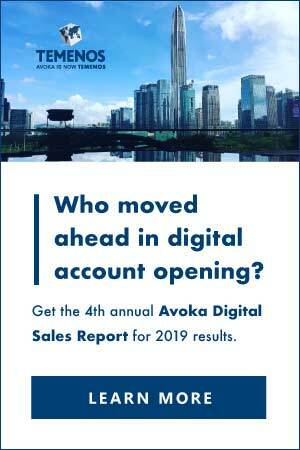 Innovating contact centers focus on data to improve first call resolution and deliver superior sales and revenue production. 2. Leading. A little more than a quarter of bank and credit union contact centers were characterized as Leading. These contact centers optimize call-handling with the use of skills-based routing, workforce optimization, and core integration. They utilize workflow, intranet, and CRM to minimize hold times and transfers. Representatives at leading contact centers are empowered, and enjoy schedule flexibility and clear career paths. 3. Managing. Contact centers at nearly half of financial institutions handle interactions in a primarily centralized fashion and have implemented service level targets. Processes for these contact centers, however, are often hampered by underutilized and unintegrated technologies. Managing contact centers are commonly perceived as an extension of operations with a limited scope and little empowerment. 4. Reacting. Keeping up with event-driven spikes in call volume characterize contact centers at this level. They have fragmented approaches to call-handling and rely on manual, paper-intensive processes. About one in five contact centers were categorized as reactive. 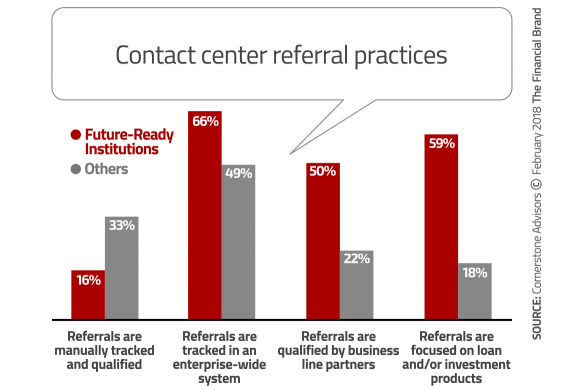 Sales practices at future-ready contact centers (Innovating and Leading) differ from other financial institutions in a number of ways, the three most important impacting sales being: 1) Referral management; 2) Outbound sales; and 3) Loans by phone. Nearly all (94%) of future-ready contact centers perform outbound calling, although 13% limit their activity to follow-up calls. In contrast, the only type of outbound calling for roughly half of other institutions is follow up on inbound calls and issue resolution. 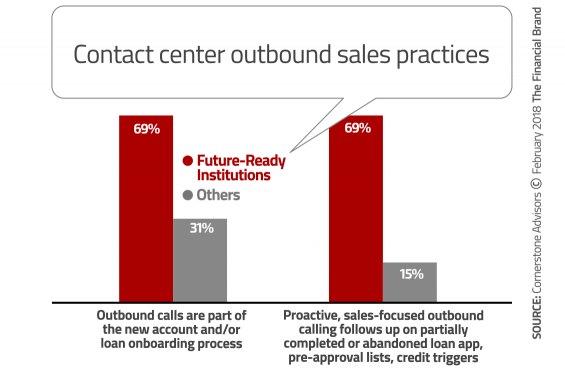 Nearly seven in ten future-ready contact centers make outbound calls a part of their new account onboarding process, follow up on partially completed or abandoned loans apps, and reach out to customers and prospects who have been pre-approved or meet credit trigger criteria. All of the future-ready contact centers in the study take loan applications over the phone, in contrast to seven in 10 other institutions. In roughly two-thirds of the other institutions that take loan apps over the phone, however, the contact center doesn’t handle the call. 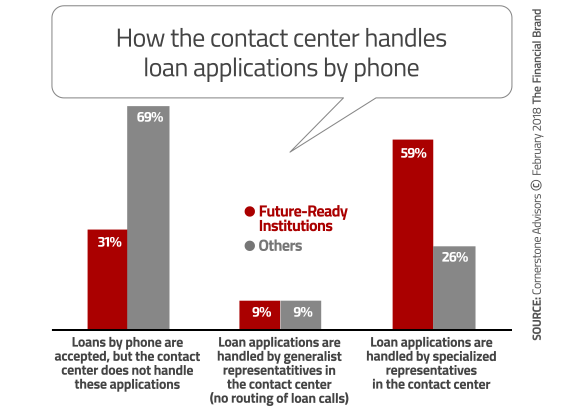 In contrast, at nearly six in 10 future-ready contact centers, specialized reps handle loan apps. Future-ready financial institutions recognize that the contact center must compete as a critical, full-service channel. 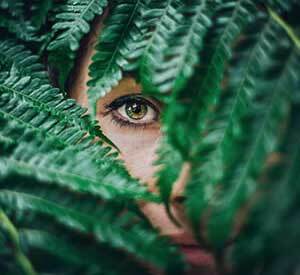 Representatives, whether inbound or outbound-focused, are given the necessary support to engage in consultative discussions about products and services. That means tailored training and coaching, properly aligned incentive plans, and data related to next-best-product and ongoing campaigns. Future-ready financial institutions ensure that reps have capabilities and systems to seamlessly fulfill a loan or deposit request at the point of interaction. Download a copy of Cornerstone Advisors’ The Future-Ready Contact Center report here. This article was originally published on February 27, 2018 . All content © 2019 by The Financial Brand and may not be reproduced by any means without permission.